Recently, I bought this clever quilting tool at a local shop. It is called "Lil Twister". The finished pinwheel table topper that the shop owner made using it was quite lovely and looked to be a labor intensive piece. She assured me that the process was actually quite simple then she kindly explained it to me. I must admit, I had a hard time grasping the concept at first as it seemed to defy logic but being adventurous, I bought the Lil Twister and took it for a spin. The Lil Twister comes in two sizes. 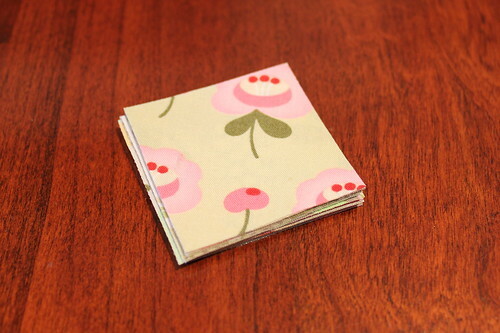 The smaller is to be used with 5" charm squares; the larger with 10" layer cake squares. I bough the smaller one. The first step, pictured above, is quite simple. 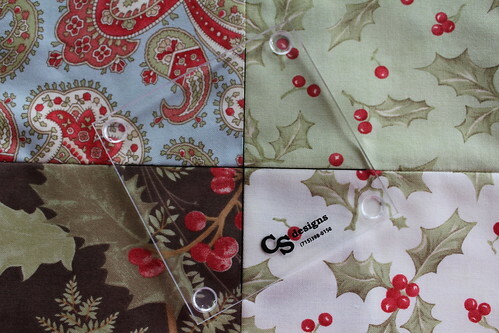 Arrange and sew your individual squares together. I chose a square arrangement, five charms high by five charms wide however you can arrange any size square or rectangle that you please. You do need to keep in mind however that your final, "twisted" work will be somewhat smaller than your original layout as trimming needs to be done. 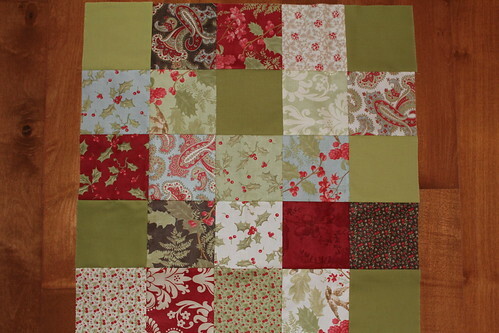 Once your squares are assembled, you need to add a border on all four sides. For the smaller, charm size Lil Twister, the border needs to measure 3" in width. 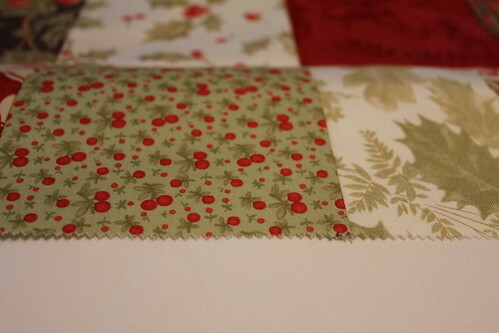 I think for these Christmas fabrics, a white border will do nicely. This is where the clever part begins. First, align the cross hairs of the tool with an intersection of your assembly. Trace around the tool with a pencil, move on to the next intersection and repeat. Do this until every intersection is marked, including those at the border. Be sure to keep your template aligned in the same direction throughout this process. Once you have marked your squares at each intersection, cut along the traced lines. 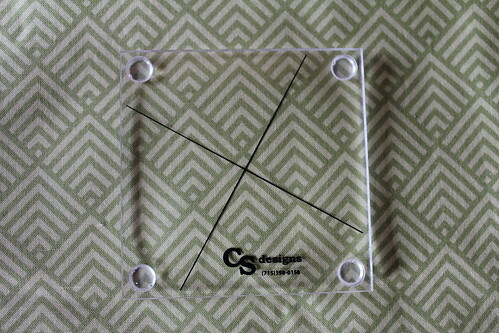 I roughly cut out my squares first with scissors then I trimmed them with a rotary cutter. Using a rotary cutter first to cut the squares in lieu of scissors can be done however over-cutting could cause you to accidentally nick an adjacent square. I preferred to avoid doing that! Once your squares are cut, arrange them into pinwheel shapes. As a result of the previous exercise, each of the original charm or layer cake squares ends up being cut into four wedge shaped pieces. By rotating or twisting each of these pieces, pinwheels are formed. I used some orphaned charm squares to make the above configuration which still needs to be sewn together, batted, backed, etc. Overall, I am very pleased with the Lil Twister tool, finding it hard to believe that there continue to be ingenious inventions such as these that take a completely different and modern approach to a traditional craft. A few notes on fabric selection and arrangement. Hind sight being 20/20, I can now clearly see that great emphasis should be placed on color, value, pattern and arrangement of the initial squares. You will note that the lower right hand pinwheel in the above image is very similar in color and value to the border fabric that I selected. It would have been better for me to have initially placed this square in the center of the assembly as opposed to adjacent to the border. Some of my central fabrics were similar in value to one another causing those pinwheels to be less defined than I would have liked. 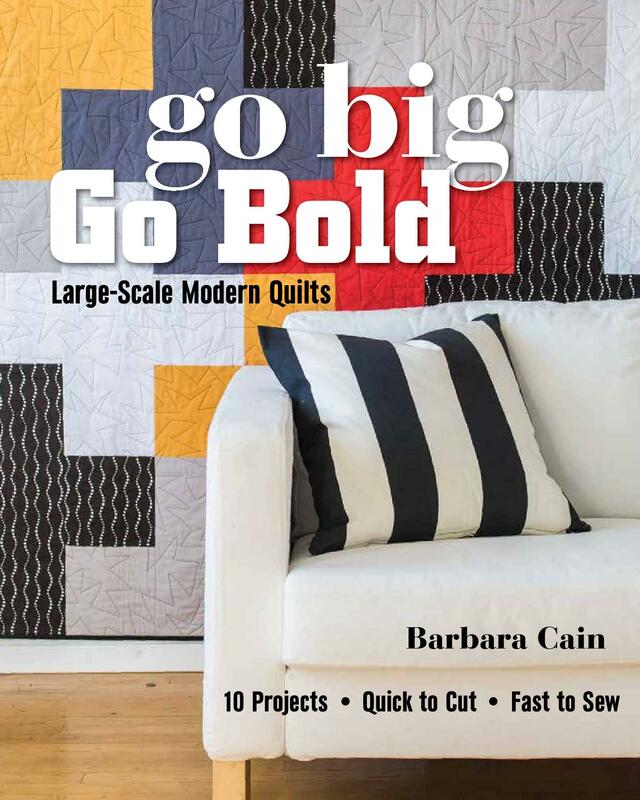 Lastly, a few of the fabrics that I selected had rather large patterns for this scale of block. Once they were quartered and twisted, some confusion resulted, again causing loss of definition of a few of the pinwheels. I believe that these results can be mitigated by quilting, possibly by alternating my stitching pattern in adjacent blocks or by outline quilting each pinwheel to create more definition. Next time, I will more thoughtfully arrange my squares! One concern I did have when I first saw the instructions for the Lil Twister, was the waste that results once the squares are cut out. Fortunately, this waste comes in the form of usable squares. Depending on how carefully you cut, when using the smaller Lil Twister, you can salvage one, 2 1/2" bias cut square out of each fabric. These will certainly be used for another project. 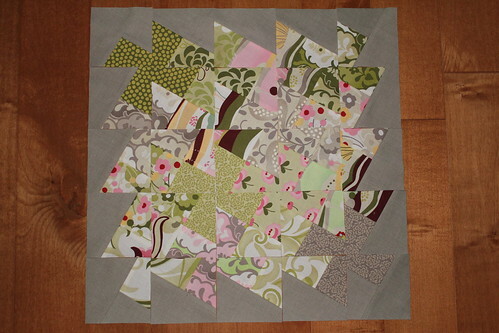 I'll be sure to post the finished Lil Twister quilt experiments as soon as they are complete! Click here to see the finished results! I just bought one of these and appreciate your comments so I don't end up having too much "20-20 hindsight". Thank you!